As winter finally turns to spring, gardeners everywhere breathe a collective sigh of relief. 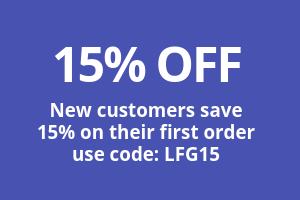 At last, we can get back outdoors where the birds are singing and flowers are blooming! Our enthusiasm and pent up energy is a good thing, because spring to-do lists can be overwhelming. 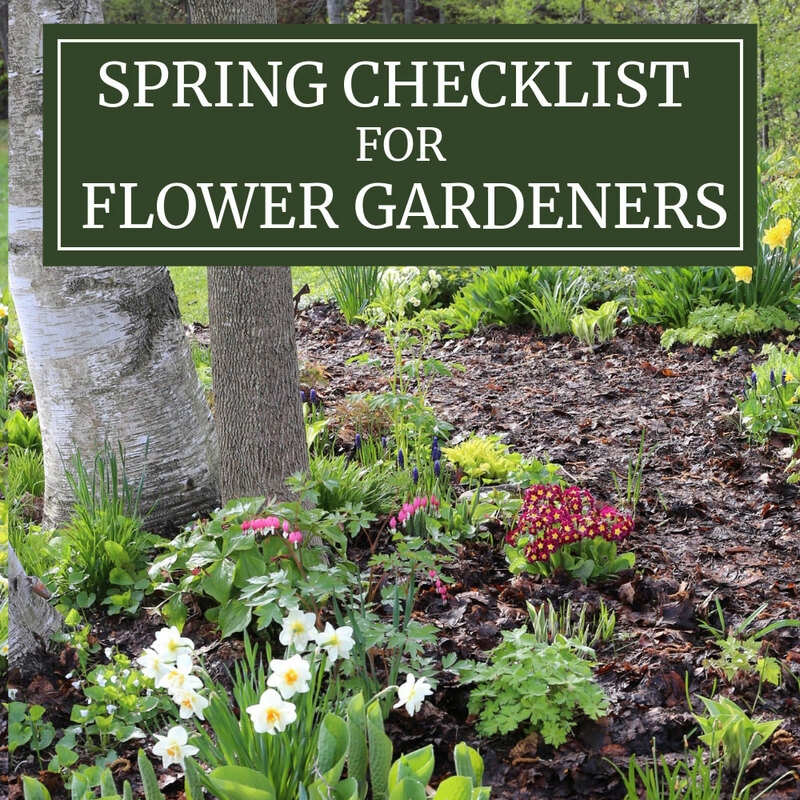 Here are six tasks that deserve to be near the top of your early spring checklist. Tackle them now and you’ll reap the benefits all season long. One reason to divide perennials is to generate additional plants for your own garden and to share with friends. But there’s another more important reason. 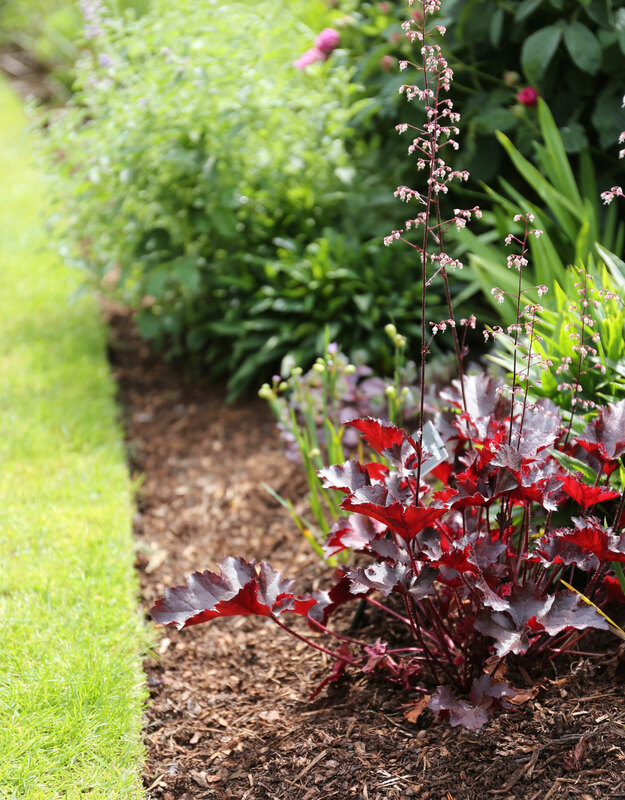 Many perennials need to be divided regularly to maintain an attractive appearance. 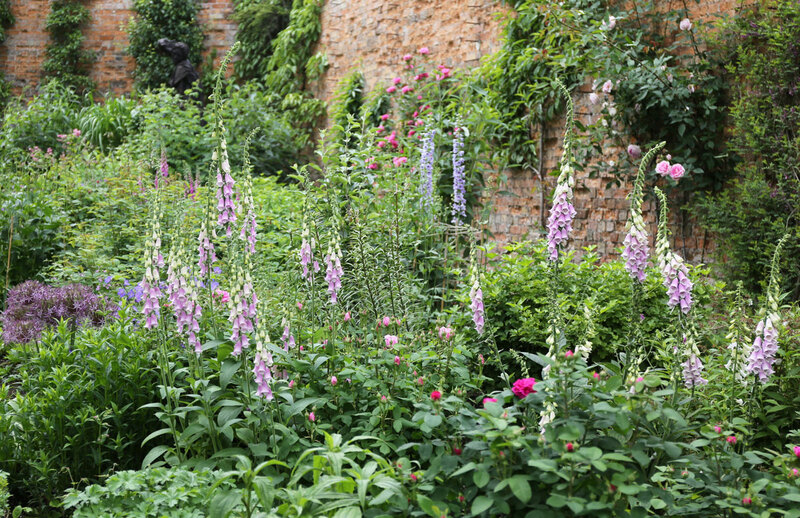 Slow-growing, long-lived perennials such as peonies, clematis, baptisia and goatsbeard almost never need dividing. Those that grow faster may need to be divided as often as every three or four years. If ignored, they start encroaching on their neighbors, develop dead spots in the middle, and may stop blooming. Perennials that should be divided regularly include sedum, aster, yarrow, iris, heuchera, shasta daisy, creeping phlox and ornamental grasses. 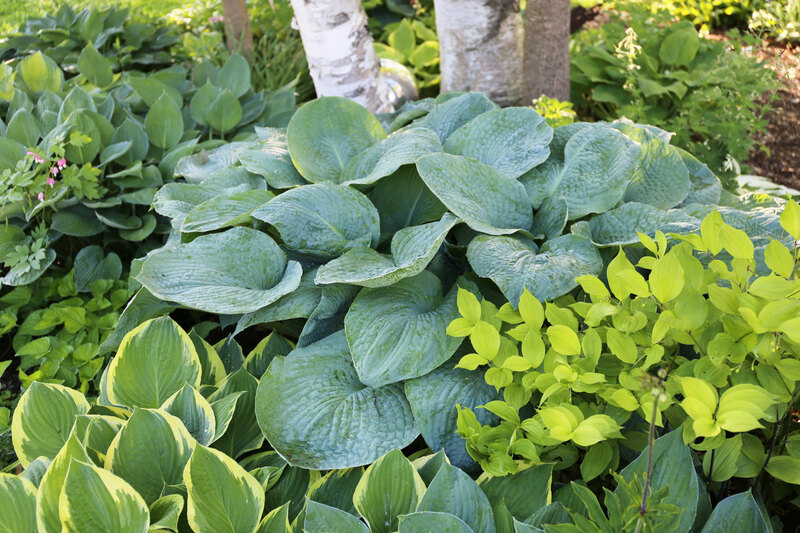 The best time to divide perennials is early spring when plants are just starting to wake up. There are two approaches. The easiest is to use a spade to chop the plant in half. Remove one chunk and then adjust the one that remains so it sits in the middle of the space. The other option is to dig up the entire plant and put it on a tarp. Then you can either cut it into pieces or pull it apart into more manageable clumps. Discard the weak parts and replant only the most vigorous sections. 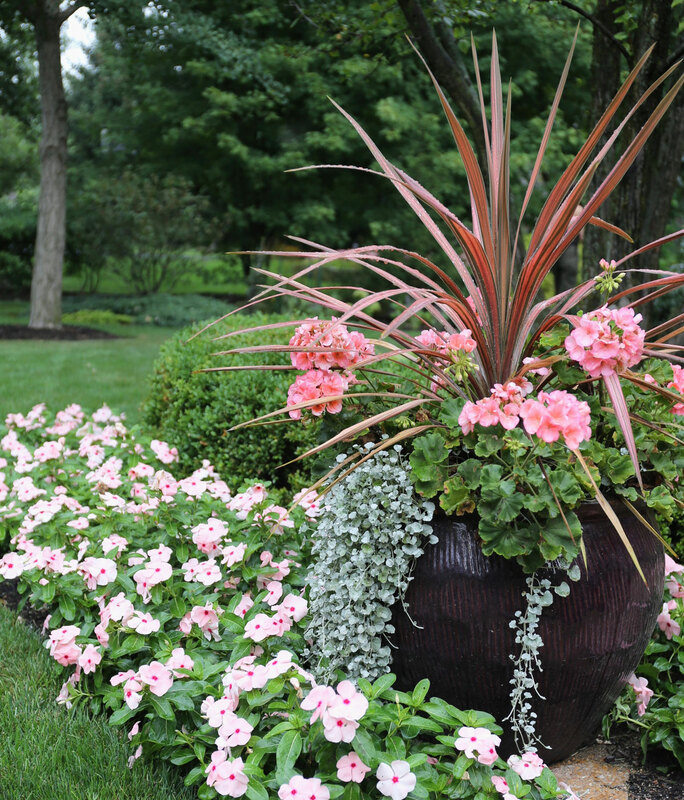 Impatiens and other annuals will keep your garden colorful from June to September. Combining annuals with perennials makes it easier to keep your garden colorful all season long. Most perennials bloom only at a certain time during the season – peonies in May, astilbes in June, echinacea in July. Annuals, on the other hand, bloom steadily all season long. 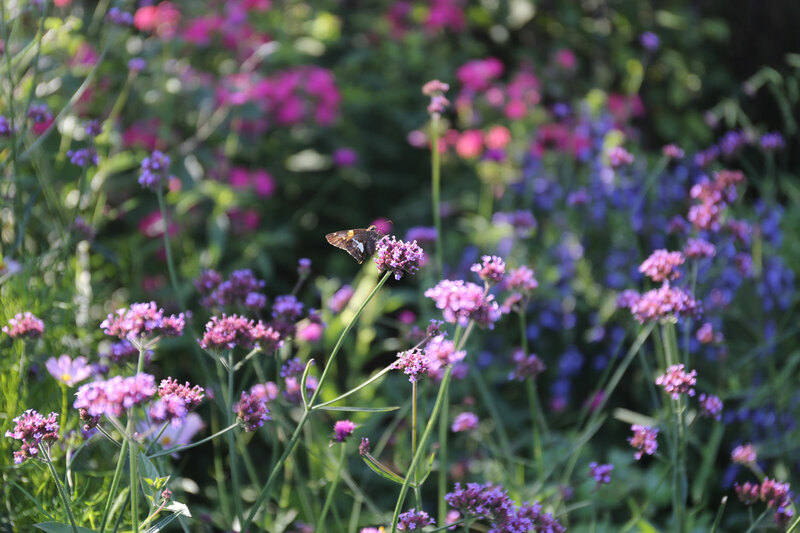 Verbena bonariensis is easy to grow from seed. It’s a late summer star and a butterfly favorite. Annuals are usually purchased as seedlings from a garden center. But growing some of your annuals from seed is both fun and economical. You can grow dozens of plants from a $3.00 packet of seeds. Sow the seeds in early spring and you’ll be surprised how quickly they reach flowering size. Good candidates include zinnias, amaranth, verbena, cosmos, bachelor buttons, larkspur, mallow, poppies, sunflowers, marigolds and cleome. 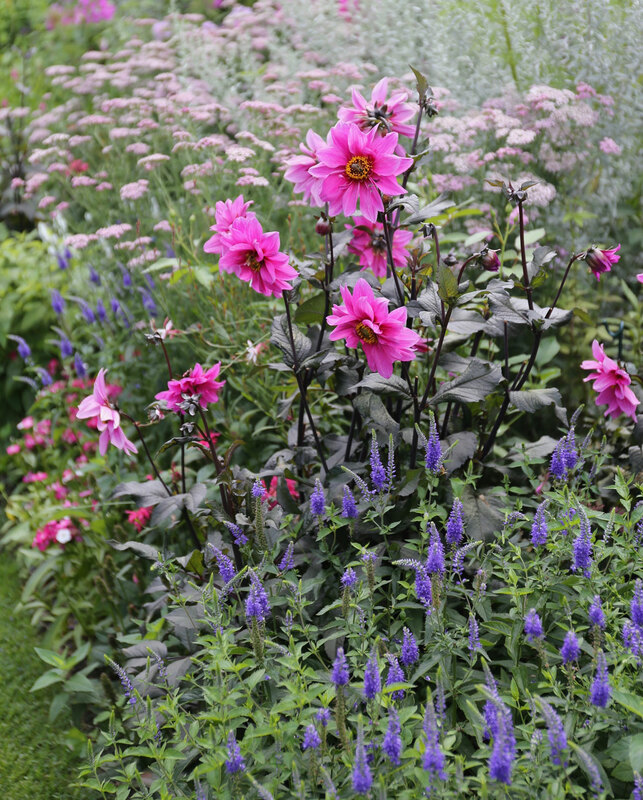 Dahlia Fascination’s bright pink flowers and dark foliage add punch to this late summer perennial border. Some of the best flowers for late season color are summer-blooming bulbs. 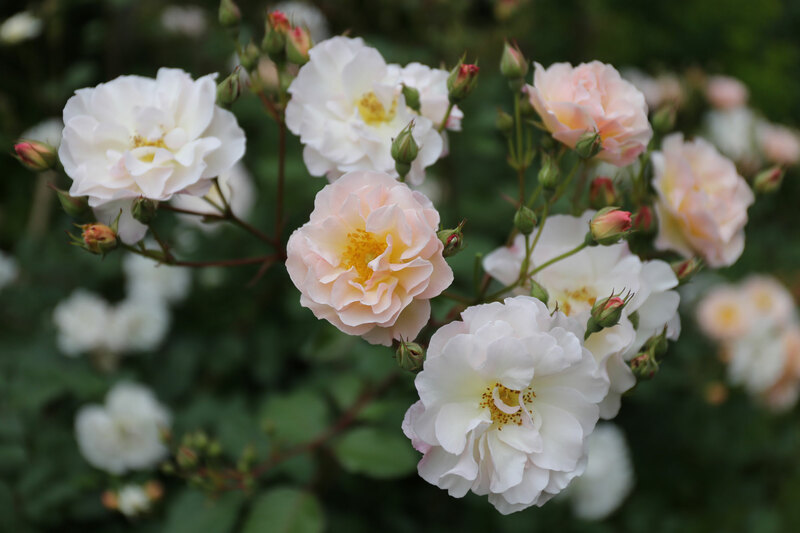 These heat-loving plants typically maintain a low profile during the first part of the season, but by midsummer, they are blooming their heads off. Since there’s no need for these plants to produce seeds (like an annual) or begin preparing for winter dormancy (like a perennial), they can continue flowering with abandon right through the fall. 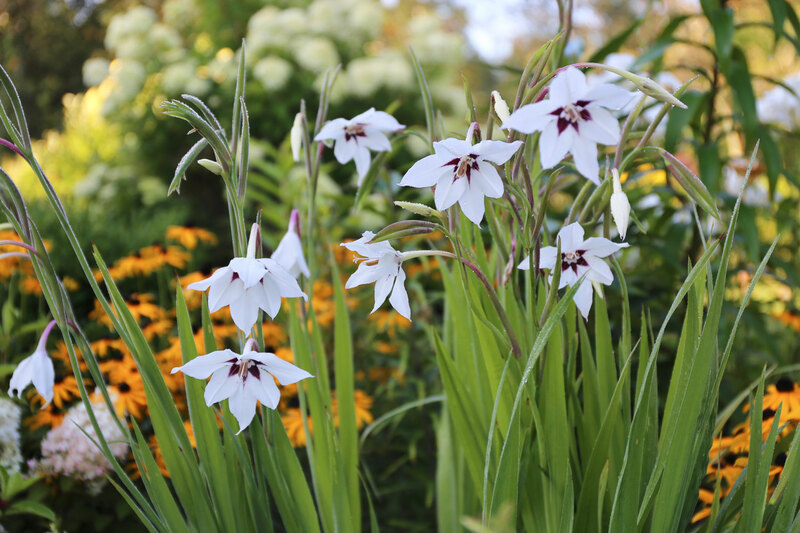 Acidanthera adds fragrance and freshness to a late summer flower garden. Summer bulbs grow remarkably fast. Plant them in spring and they’ll be mature just a few months later. Consider adding some of these favorites to your flower garden: dahlias, lilies, gladiolus, caladiums, cannas, callas, eucomis and acidanthera. No matter what size flower garden you tend, containers have an important role to play. They bring a burst of color and interesting texture to places that would otherwise go without. 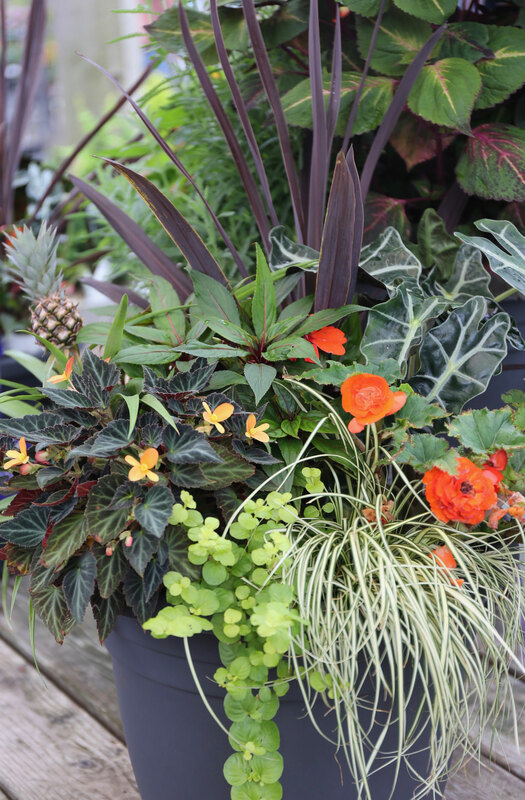 Containers also give you the opportunity to incorporate unusual plants that might not thrive or look appropriate in a garden bed. Eucomis ‘Leia’ blooming in late July. You probably plant decorative containers for your deck, patio, porch or entryway, but here’s another way to put containers to work in your garden. 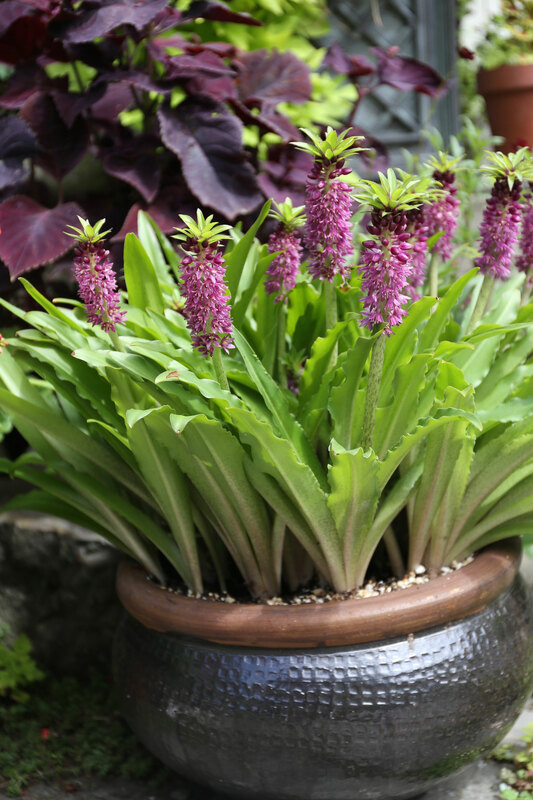 Gather some 2 and 3-gallon nursery pots and fill them with summer bulbs such as dahlias, lilies, callas, acidanthera and even glads and cannas. After planting, put the pots somewhere out of the way until later in the summer. In August, these plants will be exactly what you need to perk up a fading flower bed or refresh a tired-looking planter. 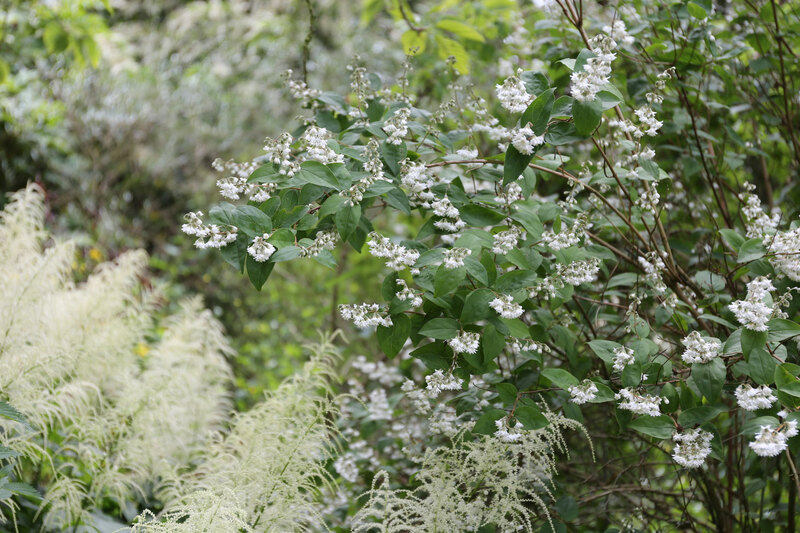 Shrubs, like this deutzia, can be beautiful in a flower garden but it’s important to keep them from taking over. Flower gardens often incorporate shrubs to add privacy, frame views and help create a sense of enclosure. But it’s easy for shrubs to outgrow their intended space. An early spring pruning lets you keep them at a size that’s appropriate for the garden. 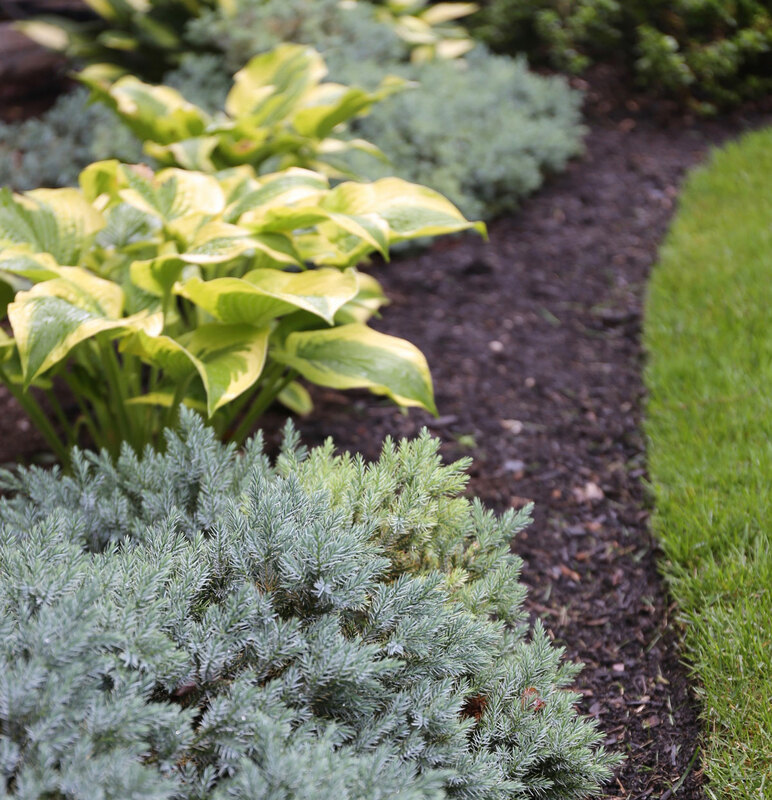 Early spring is an ideal time to prune any shrub that’s evergreen or that blooms between July and September. These include hydrangea, butterfly bush, clethra, roses, trumpet vine and beautyberry. Pruning before these plants leaf out makes it easier to see the overall structure and identify problem areas. Shrubs that bloom early in the season (before mid-June) should not be pruned until right after they flower. 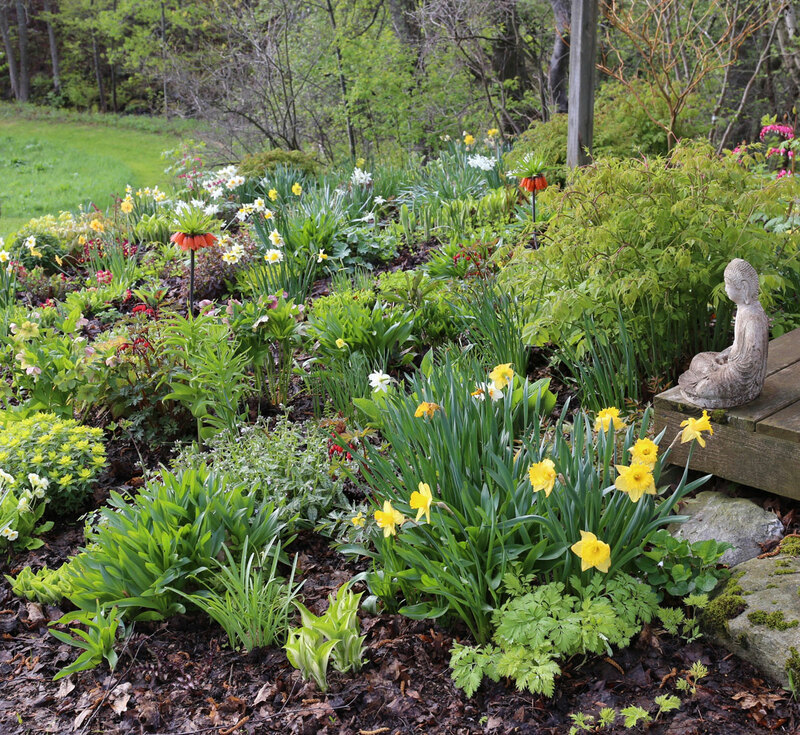 There’s no quicker way to spruce up a flower garden than to give it a neat edge, and early spring is the best time to do it. You can use a hand edger with a half-moon head, a sharp, flat-headed spade, or an electric or gas-powered edger. A more permanent option is to install a continuous barrier made of plastic or steel edging. Done right, permanent edging is all but invisible and lasts for decades. Once you have cut a clean edge, it’s time to mulch. Keeping the soil surface covered with leaf mold, compost or shredded leaves will discourage new weeds from germinating and make any new weeds easy to pull out. In flower gardens, it’s best to avoid using bark chips or shredded bark. 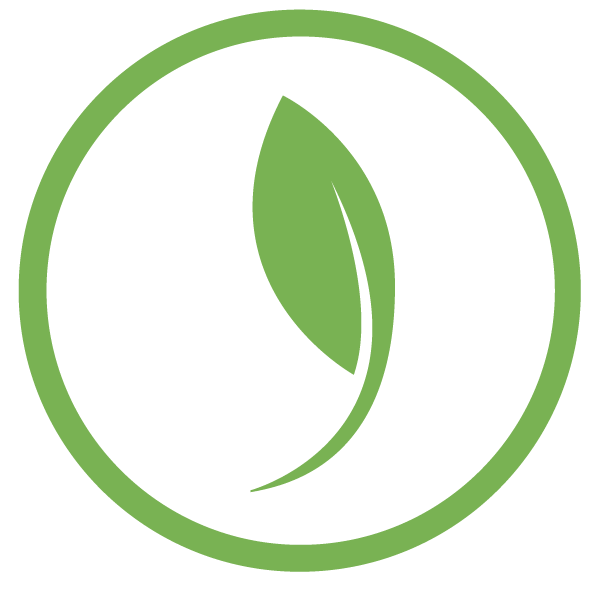 Though they add valuable organic matter to the soil, the decomposition process consumers nutrients that would otherwise be available to plants. Spring is the best time of year to invest in your garden. Cool weather makes any job easier, and when plants are just getting started, they don’t mind being pruned, moved and divided. So make yourself a pot of tea, pull on your bookts and start chopping that spring checklist down to size!